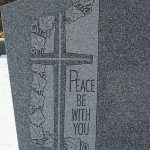 At Tri-County Memorials, we firmly believe that a monument should be a unique reflection of the person who it stands for. And that’s why we offer an extensive variety of colors, designs, and styles. 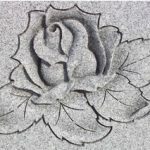 From flush markers to mausoleums, Gem Mist to Dakota Mahogany, we’ll work with you to select the components that will best commemorate your loved one. The outline of the design is carved, while the inside is made to present a shape — often a flower or a plant. We can carve a name or design into the face of the monument, and can remove the granite polish for an "axed" surface. Using a recessed area to create contrast, we can sculpt an image to present a 3-dimensional design. 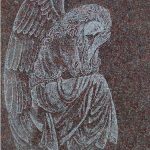 Provide us with a memorable image that you like, and we’ll etch it into the granite of your memorial — ensuring it lasts forever. We have an array of lettering for granite, bronze, and marble gravestones. Show us what you want, and we’ll work to match it. Tri-County Memorials possesses an extensive variety of colors. If you have a particular request that you don’t see here, come into one of our locations in Norwich, Waterford, or Willimantic, or give us a call at 860-886-6200, and we’ll work with you to find one that suits your desires. Please see our Color Gallery for more our many styles of color. Serving as buildings where people are entombed, mausoleums can either come with or without stained-glass windows and doors. These angled markers possess a slight pitch. The front stands at ground level, while the back is a few inches off the ground. Equally capable of being a standalone monument or attached to an adjacent memorial, bronze markers are a nice way to commemorate a loved one. Typically 16 or so inches above the ground with the back of the stone straight vertical, slant grave markers generally possess a front that slopes at around a 45 degree angle. Able to be customized to cemetery requirements, flush markers are generally 24" x 12" and are a good choice for couples buried in close proximity. Granite benches to commemorate a loved one are an excellent choice for a variety of locations. They can be situated in parks, cemeteries, or even in your backyard. A longtime staple seen throughout cemeteries nationwide, traditional uprights are a timeless classic that are every bit as functional as they are dignified.